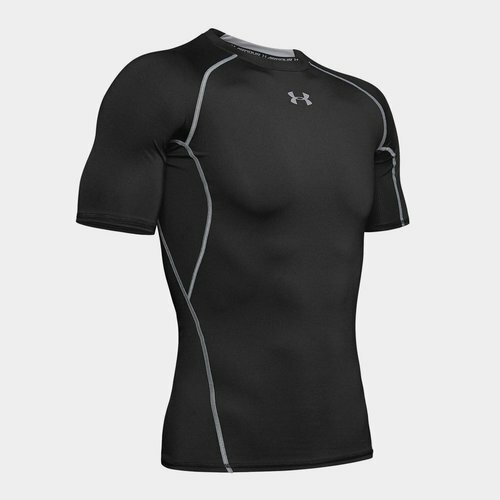 A snug and lightweight fit armed with performance materials, slip into Under Armour's HeatGear Armour Compression S/S T-Shirt. Made from a soft blend of polyester and elastane, the soft fabric is kitted out with HeatGear to leave you with a cool, dry and light feel during any activity. Designed for a compression fit, this also aids your blood circulation and generates more oxygenated blood in your muscles so you can perform for longer and recover faster. Sporting a plain black look with grey stitching to easily complement other kit, Under Armour branding features on the back of the collar as well as the front of the neck.